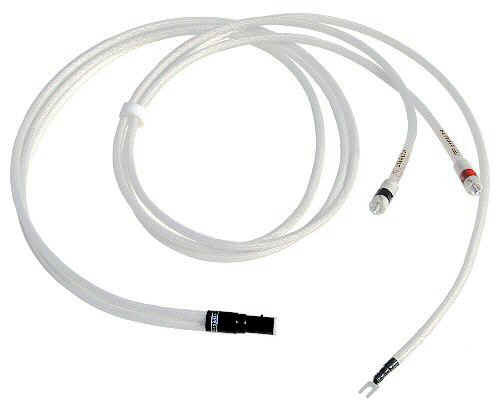 The Hyperphono is, in fact, a three-cable assembly in one package: two identical signal cables, and one more (same diameter, but different inside) run for the ground. The three cables join at the mini-DIN and run separately from each other, being held together only by a machined Teflon tri-nut that slides back and forth for the most convenient cable arrangement and no hassle connection to any phono preamp or an MC step-up transformer. 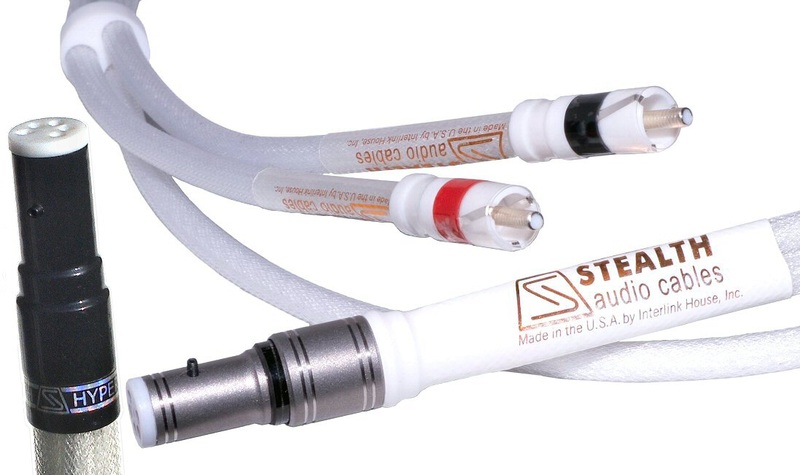 In the RCA to RCA version, the three cables join at the middle, and run separately to both RCA-terminated ends. 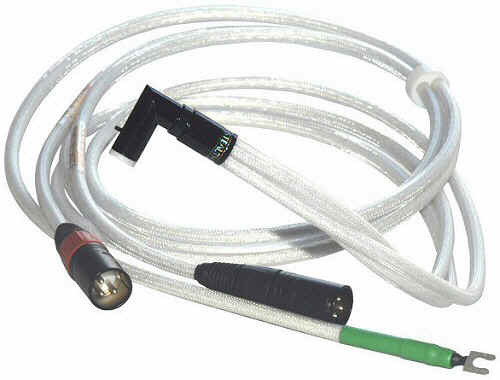 The Hyperphono is available in mini-DIN to RCA, mini-DIN to XLR, and RCA to RCA configurations. The standard Hyperphono, made until 2014, was made in two versions: straight and 90-degrees mini-DIN. The newest version, Hyperphono V14 introduces a new, single universal "FLEX" mini-DIN - which fits tonearms that require both the straight miniDIN and the 90-degress miniDin without any modifications. The thin mini-DIN "tale" is designed to be bent at sharp angles without a risk of brakeage, and makes the connection much easier than before. The balanced version of the Hyperphono V14 features STEALTH proprietary XLRs with carbon fiber shells, machined Teflon dielectric and solid silver contacts. The Hyperphono has STEALTH proprietary, highly advanced custom connectors: Teflon mini-DIN with custom machined Carbon fiber shells (both straight and 90 degrees), and shell-less ultra light proprietary STEALTH RCA connectors (same concept and basic design as the original Indra connectors, but no shells, just machined Teflon body with integrated very light weight solid silver contacts; the hollow solid silver center pins have Kevlar inserts, for strength). The XLR version features custom STEALTH XLRs (also with machined Teflon dielectric and solid silver contacts). Please remember that you need to apply a significant axial force to make sure the Hyperphono connectors go all the way onto the RCA females (on the back of an equipment piece). When you insert these connectors, the feel is like forcing a knife through a cold chunk of butter: it goes slowly and smoothly, but with significant resistance. Please be patient to overcome this resistance and DO insert the connectors all the way (deep) onto the RCA females. This usually requires either approaching your equipment rack from behind, or partially removing a component from a rack - to have a clear access to its back panel to insert the connectors using the axial force (along the connector's axle, along the cable)***. The Hyperphono signal path features the multi-layer matrix geometry, which is common for all top STEALTH cables, including the Indra. The conductive wire used is solid core, 50% gold 50% silver, single crystal (continuous cast) alloy. The porous Teflon dielectric assures very low energy storage = high perceived speed of the reproduced signal. The ground run features our proprietary low resistance (and low inductance!) RF transparent LITZ configuration - to assure high quality grounding up to radio frequencies. 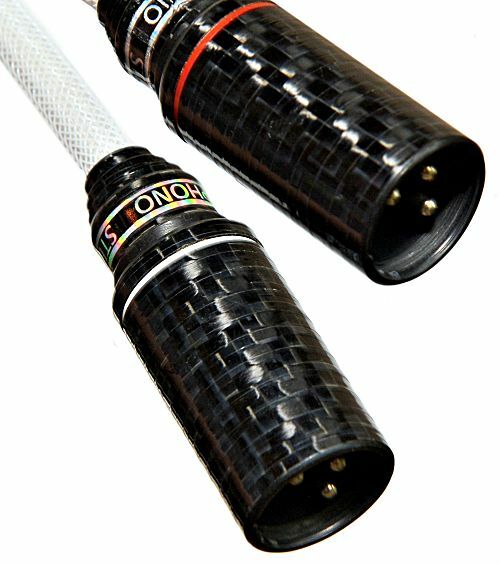 Both signal cables are shielded with metallized carbon fibers, with multiple silver plated OFC drain wires. This is very light weight and efficient shielding. The shields are electrically connected to the ground at a single point (at the ground pin of the miniDIN, or in the middle of the cable assembly (inside the carbon fiber "collar") in the RCA to RCA configuration. There are two identical solid core signal wires inside each signal cable, symmetrically woven in a matrix geometry which offers high interference and noise rejection without the capacitance increase typical for simple twisted pairs. This symmetry and identical wires mean the Hyperphono is a balanced cable. 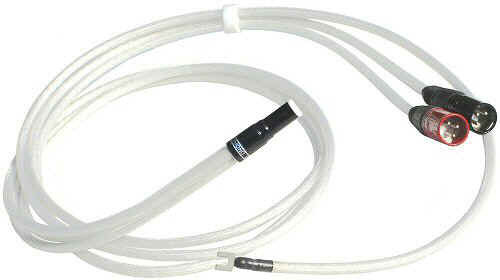 This is natural for the XLR-terminated version. But the Hyperphono is internally balanced even in the RCA-terminated version. A phono cartridge is balanced by its nature: the output from each of its two coils (one coil for each stereo channel) is symmetrical - i.e. balanced. The four inside tonearm wires that go from the four cartridge leads through the tonearm tube are all the same - i.e. this path is also balanced. And thus an optimally made phono cable must follow this pattern - i.e. must be balanced (inside) - regardless of whether a phono preamp is balanced or single-ended. The absolute best phono stages are balanced (it simply makes sense to make them balanced - to assure the highest possible interference rejection) - but even with a single-ended phono preamp (terminated with the RCA-type connectors) a balanced phono cable works better than asymmetrical (coaxial): due to its balanced nature, it is considerably less noisy than a traditional single-ended phono cable. Reduced noise is obviously nice all by itself, but its indirect benefit is lower IM distortion, and the result is a readily audible boost in perceived (subjective) clarity of reproduction - compare to any regular phono cable. The differences in phono cables are much more audible than in line-level interconnects - because of the much smaller signal, and therefore much higher amplification: typical line-level signal is 1 volts, while the typical MC cartridge output is 0.3 millivolts - i.e. 3000 times (!) as low. The Hyperphono is exceptionally quiet, and it is immediately noticed by all listeners - most of them don't even suspect how quiet their phono setup can actually be! Because of its numerous highly advanced features (listed above), the Hyperphono sonic advantages are immediately apparent in any high-end phono setup. 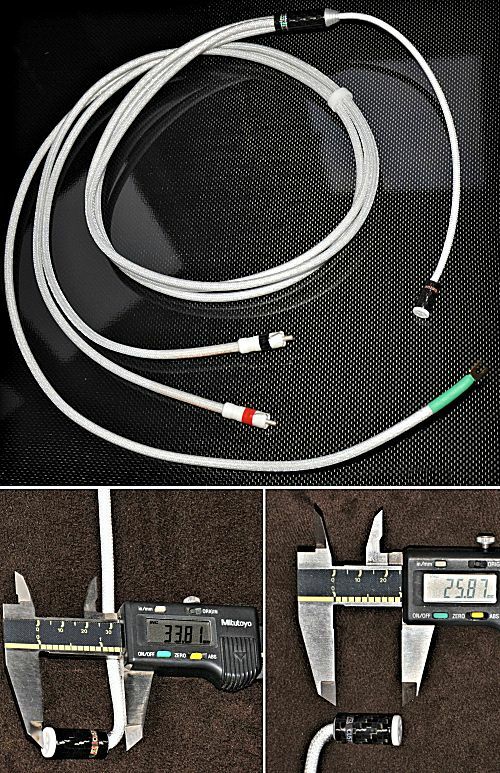 The suggested retail price is for a 1.2 meters or shorter Hyperphono cable is $3,800, $4,200 for a 1.5 meters cable, and $4,800 for a 2 meters cable. Due to the high customization required for each individual quality phono setup, the Hyperphono cables are made to order (2 to 3 weeks average lead time). *** It is recommended to clean (wipe) the RCA females (on the back of your equipment) with rubbing (isopropyl or ethyl) alcohol right before connecting the cables to the equipment. The STEALTH RCA connectors go in easier if the outer surfaces of the RCA females are still wet with alcohol. The body of the STEALTH RCA connector is machined of Teflon. There are three solid silver strips that make the actual electrical contact. 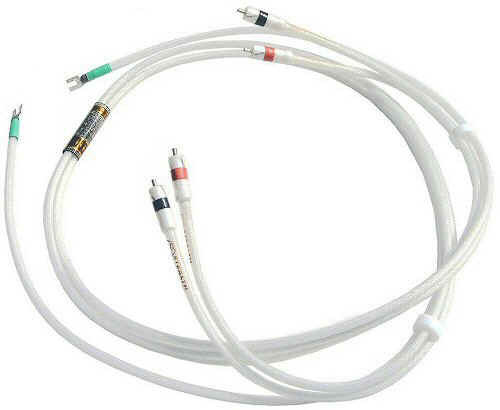 When the cable is connected to the equipment, these silver strips are pressed to the outer part of the RCA female by the Teflon cylinder. The internal diameter of the Teflon cylinder is slightly smaller than the RCA female diameter. 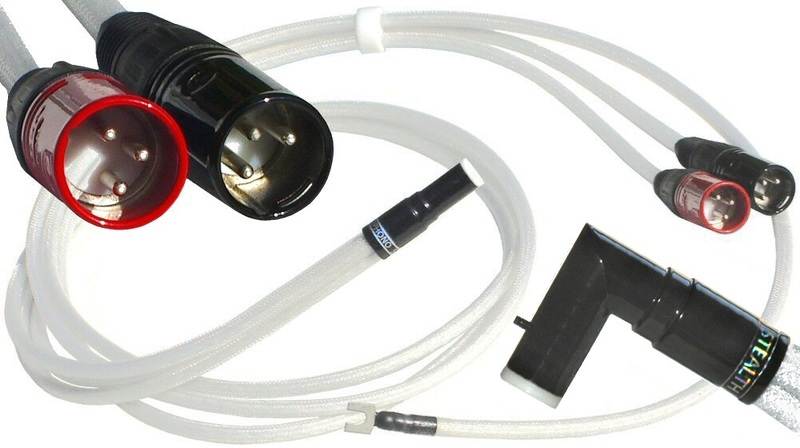 When the connector is connected to an RCA female for the first time, the Teflon cylinder softly expands to accommodate the shape and the exact diameter of the RCA female. Once connected, the STEALTH RCA connector sits very tight on the RCA female. 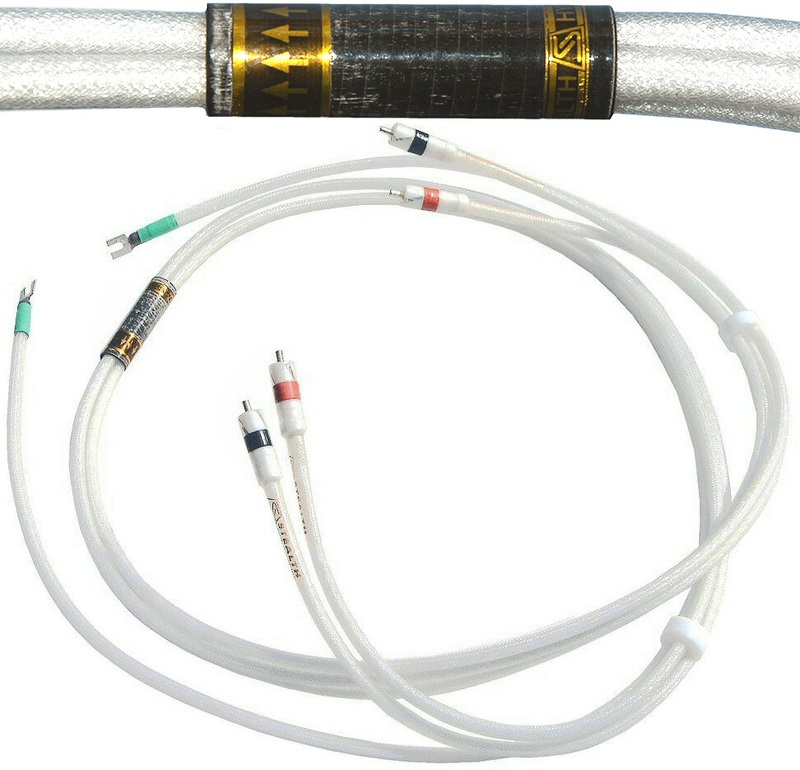 The electrical connection between these silver strips and the conductive part of RCA female is very reliable and firm, the actual contact surfaces do not oxidize, and the connection doesn’t deteriorate with time. When you disconnect the cable, and then reconnect it again, it shall go in much easier than the first time.